Earlier this week, Dennis Ritchie died. To many people, this event went unnoticed. But to those in the computer world, we mourned, because Dennis Ritchie changed the world. In the 1970s, Ritchie worked at Bell Labs, and he developed the C programming language and helped develop Unix. To those not in the computer industry, let me explain this in simple terms. Microsoft uses C to write the Windows operating system. Microsoft Windows provides Unix APIs for developers to use. Steve Jobs brought Unix to Apple, and all current day Apple products run a Unix core, with their GUI on top. Linux is a derivative of Unix, written by Torval Linus and given away for free. 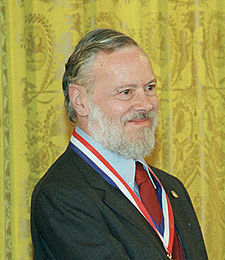 Whether or not you are using a desktop computer, laptop, netbook, tablet, or smart phone, the operating system would not exist as is without Dennis Ritchie. So raise a glass or bow your head, but I urge you to take a moment today to honor Dennis Ritchie, a quiet man who changed the world. 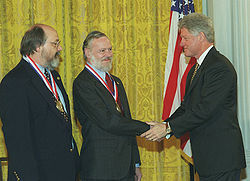 Ken Thompson and Dennis Ritchie receiving the National Medal of Technology from President Clinton in 1999.